The Liver Cleansing Diet by Dr. Sandra Cabot, was one of the first detox books written. After release it quickly became a huge bestseller. After seeing numerous overweight patients, many with sluggish metabolisms, Dr Cabot decided that liver function was impaired – due to poor diet and nutrition. Dr Cabot claimed that improving liver function led to weight loss. After 2 years of working successfully with 1540 patients she professes a 100% success rate. Liver Cleanse – Cure for all ills? Dr Cabot seems to attribute poor liver function to a vast range of symptoms, some of which could be diagnosed by any number of conditions. Always consult your doctor before diagnosing or treating yourself with some list or book. The diet is strict, with all vegetables to be eaten raw. Liver Cleansing Supplements are recommended. The premise of this diet is good, but it seems to be too simplistic to blame a single organ for most people’s weight and health issues. Detox diets are useful, but don’t necessary aid or teach you in forming lifelong good eating habits. There is also a lack of scientific evidence proving that detoxifying diets are as effective as they are claimed. If you have to continually ‘reach’ for a detox diet, then something in your everyday nutrition and lifestyle is not right. Rouiller, C. (Ed.). (2013). The liver: morphology, biochemistry, physiology. Academic Press. oh also a biggy! no alcohol!! i am only 18 years old i have no weight problem, im slim and i have a weak immune system and my liver is not working right. note. you do not neccessarilly have to have these symptoms in order to have a bad liver. i experienced this due to all the medication i have been given which made it hard for my liver to fight against the poisons. if you are taking any anibiotics i recommend you get off of them and see a homeopathic doctor. because the anibiotics are not natural for your body and homeopathic medicine is the way to go. my doctor gave me a list of foods to avoid and suggestions for what to eat. AVOID: Pork; Red meat; Chocolate; any cheese exept for white chesses; avoid food coloring; any fried foods; oils and grease; avocado (yea it suprised me too); any colored soft drinks; only drink 2 or 1% milk;no nuts of any kind; Saussage; nothing instant;I cant remember all the rest right now as soon as i get my list again ill write the rest. FOODS RECCOMENDED: Only regular coffee not decaf; fruit; vegies; only whole wheat breads, cereals and bagels ect; any beans may be eaten as long as without pork or saussage; may eat any seafoods; rice cakes; jello;ginger; only natural juices; only organic eggs. i hope this helps like i said this is only a few foods reccomended and avoided but dont worry this is most of them. also anyone interested in cleansing there liver fast i personally reccomend you should look into the ‘liver cocktail’ its not alcoholic. check this site out to find more about it..
Robyne, click on the link and buy it from amazon.com. I’ve been sober for five days now. I was smoking over 100 cigarettes a day and getting as drunk as I could every night. I think my liver is going to appreciate this. I desperately need help in losing weight. Even though I am trying my hardest, I can’t seem to take any weight off. I would like to know more about this diet before committing. Could you please send some examples of menu for this diet? my son was told he has enlanged live. can that help please help me i am in need. i really need a copy of this diet. i have all the of the symptoms and a cystic liver to boot. i can not lose wait and just this past week, i gained another 11 pounds. i don’t eat bad foods and i work out. please help!!! Amme click on the amazon link and buy a used copy for $1.35 or a new one for $14. I`m interested in the 7 day detox. can i putchase someting similar in Australia that you can recommend ? is there any side affects with liver flush? I have alevated tryglicrides.would this help? I a overweight by 40 pounds. I recently ound out I have Hepatis c. But doc said its just annabodies something(he foreigner, could not understand) But he did say I needto change my diet & my emunues could take care of the hep. What is this diet? bayslinger2007@yahoo.com Please? can you tell me what to eat with a fatty liver. 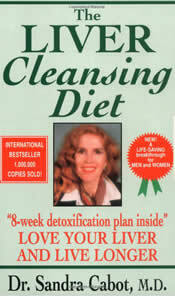 The diet does NOT require ALL vegetables to be eaten raw in Cabot’s “Liver Cleansing Diet” book. She includes MANY recipes containing obviously COOKED vegetables. While she promotes eating raw vegetables and including raw juices, she does NOT eschew ALL cooked vegetables. i have a fatty liver and i am also a debetic could you please let me know how to improve my liver. all liver funtions bloods test are normal. I have been doing liver cleansing drinks and watching what I eat, but I am confused about eating raw foods. I have a weak spleen and I heard eating raw foods would be harmful. Can you give me any advice?